The finished model horse stable doors with their fabric hinges will stand up to a lot of use. Photo copyright 2010 Lesley Shepherd, Licensed to About.com Inc. The traditional style stable doors shown here are easy to make from thin craft wood or illustration board or bookboard. 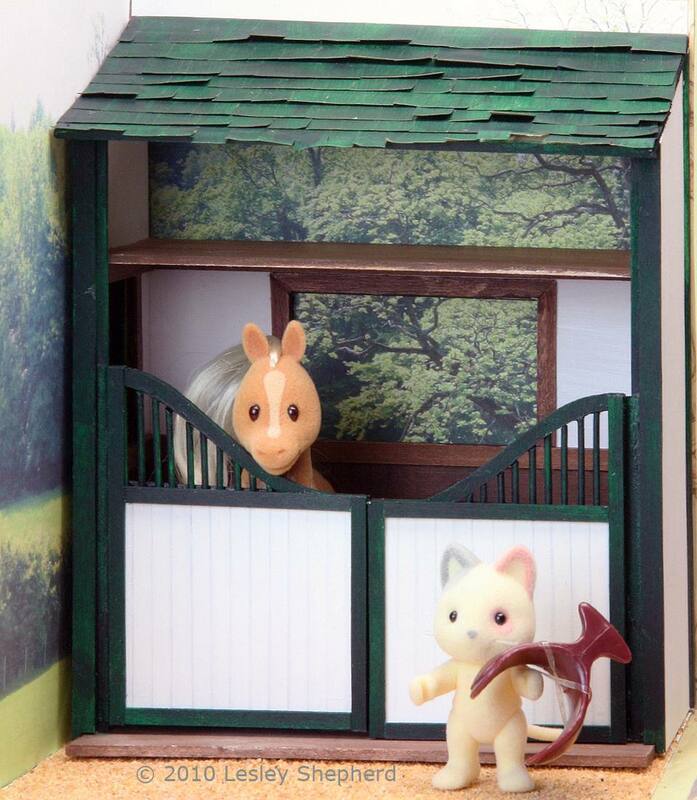 As these doors are designed to fit on a model horse stable for a child, the doors are hinged with fabric hinges, an easy technique that can be used for many other models where hinges in scale don't have the strength to support the door. These doors were designed to fit the simple scale stable designed to fit in a break away box. They can easily be made larger or smaller following the technique shown here. The doors are also traditionally used in a narrower form beside horse jumps. The stable doors start off their assembly on top of the scale plan or drawing. Photo copyright 2010 Lesley Shepherd, Licensed to About.com Inc. Door Materials -The stable doors shown here are built from 3/32 by 3 inch wide strips of basswood using trim strips of 1/16 by 3/16 inch stripwood and toothpicks or skewers for the trim bars. Basswood, jelutong, lime or hardwoods work well for these doors. You can also make sturdy doors from layers of bookboard or stiff card or illustration board.Choose a material which will not be too heavy to be supported by a fabric hinge. Fabric Hinges - use bias binding tape, or linen book tape for your hinges if possible. You want a hinge material that will absorb glue right into its weave and one which is sturdy enough to stand a lot of movement. Try to use a fabric which blends into your color scheme. Some fabrics (bias tape) can be painted after they are fitted in place, but it is easier to use a fabric which matches. You can use leather or ultrasued for hinges, but these may stretch more than woven fabric. Plan For the Stable Doors - The drawing or plan for the doors shown above is downloadable as a pdf file (acrobat reader) for stable doors. If you want to make the doors different sizes from the ones given here, enlarge or reduce the design, or simple draw your own rectangular base and run a curve across the top to suit your purpose. Building On Top Of A Plan - To make it easier to line up the various parts of the stable doors, a copy of the plan is taped to a flat work surface and covered with plastic film, something the glue will not stick to easily, but which allows you to see the plan beneath. The plan is used as a template and you assemble the doors on top of the plan, cutting the pieces to the sizes and lengths shown. Pieces You Need To Assemble These Stable Doors - To make up these stable doors you will need a rectangular piece of wood, the width and depth of the main body of your door. I used 3/32 inch basswood. The rectangle should be the same width as the doors plus the green trim on the plan, but it should be shorter than the main rectangular section of the plan by the width of half of the piece of top trim under the barred section. The bars will be glued to the top of the rectangle and the trim pieces used to sandwich them and hold them securely to the top of the door. You will also need sections of toothpick, skewer or dowels for the bars, and a curved top section cut from the same thickness of material as you use for the main body of the gate. These curves can be difficult to cut from light basswood. If you have trouble cutting the wood, cut layers of card or illustration board and glue them together to make them the correct thickness for the top of your door. On the doors I made I only used a single curved section, but cut it so the curve piece ends flush with the opening edges of the door. (see next step). Ideally you would also cut two similar curved pieces from the thinner trim to sandwich the center curve the way you sandwich the base of the door. See the next photo for the base pieces used for the doors. After the initial assembly the model horse stable doors are checked to see that they are the same size. Photo copyright 2010 Lesley Shepherd, Licensed to About.com Inc. In the photo on this page the set of scale doors are compared side by side to make sure they match at the top and base. If you didn't assemble the basic parts of the doors on top of the plan, it is easy to build doors which are slightly different heights or widths. A template helps keep matching pieces accurate. Before the door parts were glued together the curved section was cut from a copy of the plan and used as a template to cut out a curved piece that extends all the way across the top of the door to the inner edge. It is very thin at the inner edge but this will be covered by trim in the next step. A connecting upright was also cut to the size shown on the plan and runs from the hinge side of the door rectangle to the base of the curve at the top of the door. These pieces were all cut from wood which is the same thickness as the main body of the door. They will be sandwiched between trim in future steps. Sections of round toothpick (pre painted) were cut to the sizes shown on the plan and glued to the rectangular section of the door and left to dry, then the curved section of the door was fitted to them and they were glued in place against it. It is easiest to use dowels or other rounded pieces of wood which are a similar thickness to your main door parts. If the dowels are thinner than the door they will be hard to position while the glue dries. The bead board pattern on the stable door was marked on top of the painted surface with a hard pencil and an embossing tool, similar to the way the wainscotting was made for the miniature stable. Note Some types of thin craft wood will curve when painted and must be pressed flat before you proceed to glue the basic parts of the door together. A strip of fabric (bias tape) is glued to the back edge of a model stable door to make a hinge. Photo copyright 2010 Lesley Shepherd, Licensed to About.com Inc.
Cut a length of linen book tape or bias binding so that it will fit under a section of door trim (the green) along the edge of your door from the top to the bottom (see photo), and will extend far enough out from the door to be glued securely to the trim on the door frame. I cut my pieces of bias tape 3/4 of an inch wide and trimmed them to fit after they were attached to the doors. Apply a fairly heavy layer of glue to the fabric (must be applied to the fabric so it will work into the fabric weave). Use a glue spreader to press the glued fabric glue side down onto the back side of the door along the hinged side (longest side). Make sure the fabric is glued only to the portion of the edge of the door that will be covered by a piece of trim. If you are using bias tape, be careful not to pull the fabric so that it stretches out of shape. You want a clean line of fabric along the edge of the door, roughly 1/8 of an inch into the longest edge of the door (see photo) Set aside to dry thoroughly. Repeat on the second door. The hinge is glued to the back side of the door. A piece of painted stripwood is fitted over the fabric hinge glued to the edge of the model horse stable door to stabilize and strengthen the hinge. Photo copyright 2010 Lesley Shepherd, Licensed to About.com Inc.
Cut the long piece of trim that runs along the hinge edge from the top to the bottom of the door. Glue it securely over the edge of the fabric you glued to the door in the previous step, covering the fabric hinge edge where it attaches to the door. Make sure you line the trim up with the outer edge of the door as well. Clamp it securely and leave to dry. Repeat this on the other stable door. With the fabric hinge covered, the other trim sections of stripwood are glued to the front and back of a door for a model horse stable. The upper trim covers the base of the bars on the door. Photo copyright 2010 Lesley Shepherd, Licensed to About.com Inc. When the trim strip covering the hinge fabric is completely dry, apply the rest of the trim pieces to the stable doors according to the pattern on the plan. Apply the inner upright section next, then fit the cross pieces between the uprights. If you need to make your doors slightly wider, nudge the inner upright trim so that it creates a slightly wider door. Do not fit the cross pieces of trim to the door until you have the upright trim pieces glued firmly in place. Cover the Base of The Bar Trim- To cover the base of the bars on the top trim section and help secure them in place, use the trim below the bars to cover the base of the bars as well as the top section of the main door. See the photo. Make sure you match the trim pieces on both sides of the door and match the trim level on both doors in a set. A piece of trim is notched at the base and cut to the height of the stable wall. It will hold the fabric hinges of the stable doors in place. Photo copyright 2010 Lesley Shepherd, Licensed to About.com Inc.
Before you prepare to attach your hinges, make sure you have a piece of trim cut to cover the hinge fabric where it is held on the door frame. This trim helps to hold the hinge securely to the door frame. On the model stable, the trim must be notched at the base (see photo) to allow it to line up with the floor as well as the stable end walls. The door frame trim for the stable covers the endwalls and finishes the edge so this piece of trim is cut right up to the roofline. For other applications you may only need a piece of trim which is cut the length of your fabric hinge. The fabric hinge on the model stable door is glued to the front inner trim around the opening of the model horse stable. Photo copyright 2010 Lesley Shepherd, Licensed to About.com Inc. Hold the door beside the door frame (edge of the stable wall) and make sure that the free end of your hinge (the end not attached to the door) will cover the trim right to the outer edge of the doorframe (the outside edge of the stable wall). Trim the fabric to fit if necessary. Apply a generous coating of glue to the fabric and position the fabric against the inner layer of trim on the door frame (see photo) Glue it in place so that the bottom of the door is slightly above the floor. It may be helpful to hold the fabric in place with pins while you check the door position. When you have the door where you want it, smooth the fabric into the supporting trim on the door frame, then apply glue to your outer trim piece and glue it in place. (see photo, one side of the stable has the trim in place, the other shows the fabric hinge being positioned to match the first door). For a matching set of stable doors leave the first hinge to dry in place (after checking that it opens correctly against the trim , adjusting it if necessary). When the first door hinge is fully glued, start on the second hinge, using pins to hold the fabric against the wood so that you can adust the doors to a matching height. When everything matches and the door will open properly against the trim. Glue the final trim in place. If you have trouble getting the doors to open fully, you may have fitted your door too close to the door frame. Try moving it further away from the door frame to give it more space when it is fully opened. Open stable doors on a model horse stable. The fabric hinged doors will swing open as wide as the outer trim permits. Photo copyright 2010 Lesley Shepherd, Licensed to About.com Inc. When the glue has dried and your doors are fully functional, you can paint any visible bits of cloth hinge. The hinge works just at the point where it attaches to the door, so painting exposed bits not covered by trim should not affect how the door functions. The stable doors will swing both ways, so you may want to fit a catch or stop to hold them in position when they are closed. If you use fabric hinges on regular doors, you can build the frame so that the door will only swing in one direction and stops when it meets the trim in the frame.